Have you noticed that so many cereals are more dessert-like than breakfast? 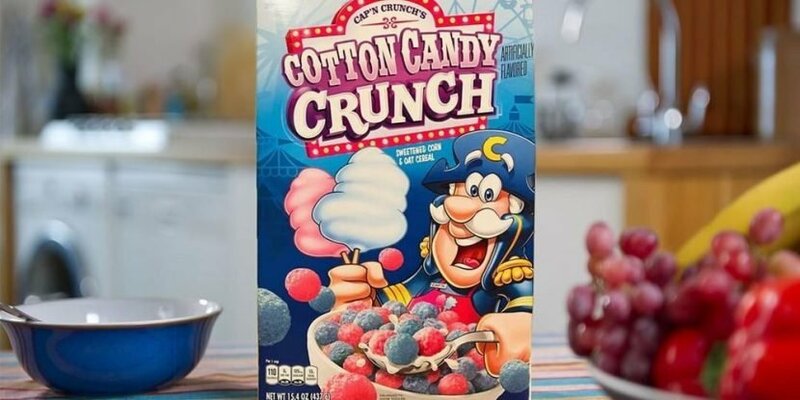 There’s Sour Patch Kids cereal and Lucky Charms Marshmallow cereal, and now Cap’n Crunch is reportedly going to follow that trend with a new flavor: cotton candy. Cotton Candy Crunch cereal has been spotted by several Instagram accounts. First, @thejunkfoodaisle posted that the cereal was “coming soon,” although there was not an actual photo. Then, a day after that, @cerealouslynet posted what may have been to the first picture on social media of the cereal. Then, a day after the initial picture, another picture was posted from @cereallife. Still following? Cereal on a spoon is basically just airy candy on a stick already, right? Coming soon from Cap'n Crunch! Thanks to @thejunkfoodaisle for the tip and @mycountymarket for the photo! The sweetened corn and oat cereal has pink and blue puffs, and a picture of the captain holding cotton candy. The pictured boxes have a “Sales Sample” disclaimer on the top left, meaning the final one may vary. Quaker has yet to confirm that the Cotton Candy Crunch cereal is hitting store shelves, but we know that Cap’n Crunch loves a new flavor, so I’m mentally willing this into fruition.